Google announced a doubling in third quarter profit this afternoon, trouncing rival Yahoo's weak performance earlier this week. The company earned $733.4 million, or $2.36 per share, in the third quarter, representing a 92 percent increase from net income of $381.2 million, or $1.32 per share, at the same time last year. Meanwhile, Yahoo earlier in the week announced profits were down 38%. Although summer is considered the weakest time of the year for Internet companies because the warm weather draws users away from their computers and Google's text ads, Google still managed to exceed analyst expectations. 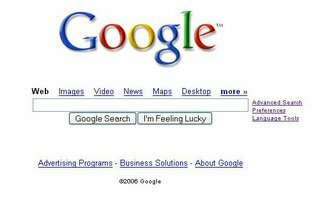 So, why is Google doing so much better than Yahoo? Where's the difference? Yahoo Inc. is still essentially a portal company. As AOL's decision to open up its doors to the public earlier this year demonstrated, there is no longer any significant value in providing handholding services to users. The market has matured enough that users can find their own way around the web. In other words, search is now the starting point for many users, and one company immediately comes to mind: Google. Many users don't immediately associate Yahoo with search because the Yahoo brand has been used to market other services like shopping, email, and auctions. In fact, according to Alexa, 51% of users go to mail.yahoo.com while only 10% goes to search.yahoo.com. 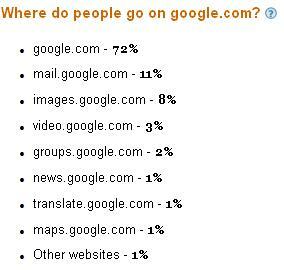 Google, on the other hand, has 72% of users going to google.com and 11% to mail.google.com. Why is this significant? Well, are you more likely to click on an ad while checking your mail or searching for something? Search is essentially a process of serendipity so users are more receptive to taking detours, say, by following attractive text ads. When five times as many users are using your email services as your search engine, that spells trouble for ad revenue. Users are very sensitive about their email. When Google indicated that ads were being targeted based on the content of users' email, that got a very negative reaction. In some ways, Gmail's deliberately slow spread was a blessing for Google since it's didn't draw users away from its search services. Another way of visualizing the difference is in the two company's respective homepages. Yahoo's is cluttered with hundreds of links scattered across the page; the sort of design that is a legacy of the early days of the Internet. By comparison, Google's UI is clean and simple; search is emphasized above all else. There is no link to Gmail. From recent news, it looks like Google is starting to realize that "Yahoo Syndrome" is starting to creep up on it. Sergey Brin has been leading a companywide effort called "Features, not products". Apparently, users can only remember about a half-dozen or so Google products, not 35. Very dangerous, especially if users forget search is one of your product offerings. Yahoo also needs to control its brand dilution. When a user signs-in to Flickr, he gets taken to a Yahoo sign-in page. That's immediately jarring because there's otherwise no sign that Yahoo owns Flickr and using Flickr shouldn't also mean registering for a Yahoo account. So, it's rather smart that Google is keeping YouTube separate from Google Video since the two user demographics don't overlap very much. Being too many things to too many people leads to the feeling that a company has no core competency. It also diverts resources away from improving core products into less crucial revenue sources. Again, the "Features, not products" campaign of Google fights against this tendency. Of course, for Yahoo, it's already a problem; the portal identity that it has retained from the early days is now a liability. Splitting off the various sub-domains of yahoo.com into their own separate, unique domains with new branding may revitalize the Yahoo brand by focusing attention on a few key products and giving a fresh chance for old products to attract new users who may be put off by the Yahoo brand name. Search is key, judging by Google's example. It's the most basic activity of anyone browsing for information. 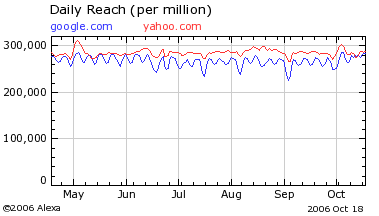 Clearly, traffic isn't a problem since Yahoo has been consistently doing better than Google in attracting users. It's simply a matter of what services those users make use of. As long as users fail to think of "search" when they think "Yahoo", Google will continue dominating Yahoo.